With the release of Origin 2017 we have included several new apps with specialized capabilities to analyze very specific sets of data. 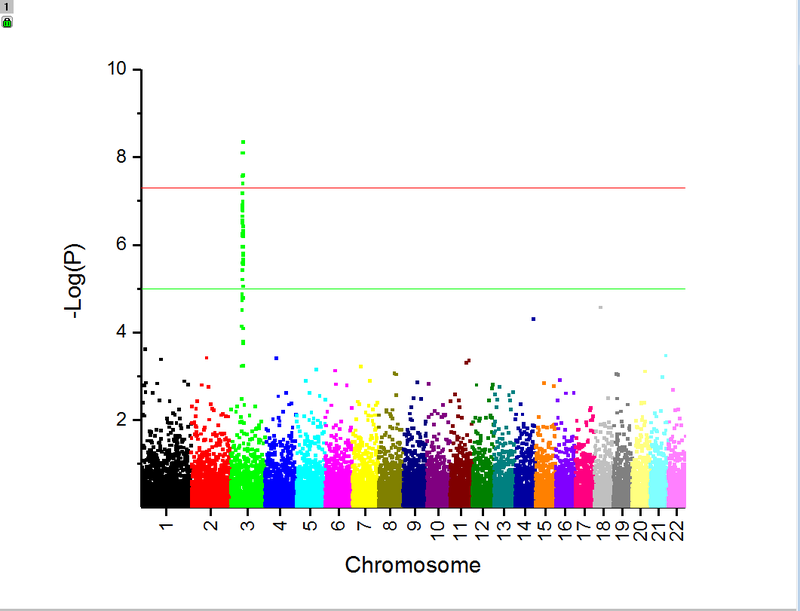 One such feature is the new Manhattan Plot app; named for its eponymous skyline, these plots allow genetics researchers to illustrate genome-wide variance in chromosomes to demonstrate associations between variants and certain traits. To be effective, these data-sets must be organized such that columns are included for accession numbers (RSIDs) for single nucleotide polymorphism, chromosomes numbers, genomic coordinates (BP), and the values of the associated p-tests. An OPJ with the result of this blog’s procedure may be downloaded here, and the Manhattan Plot app (available only for Origin 2017+) may be found on the File Exchange. Download the app and Drag and drop it into Origin 2017 to install it. The higher the y-values for the negative log of the P-tests of this data, the stronger the correlative association between that chromosome and the trait or disease in question. Good data can have a certain amount of noise however peaks should be limited to a number of chromosomes as too much variation renders such statistical test results meaningless. With properly organized data, Origin makes it easy to generate these plots. First we’ll import our data into a worksheet and make sure that our fields are properly labelled, including the SNP RSIDs, the chromosome number, the genomic coordinates, and the p-value of each. For the purposes of this example we’d like to give credit to Dr. Stephen Turner, whose generated the data used here for his original blog post for generating Manhattan plots in R.
As you may notice, the chromosome with the greatest association for the tested condition is chromosome #3, and as with any other graph, this scatter plot can be further customized in the Plot Details and Axis dialogs.